When purchasing a butane lighter, or even a more common lighter, the fuel tends to run out after multiple usage. The solution: butane aerosol cans. 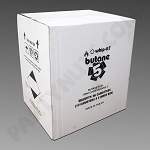 Buying butane refill cans often includes free flints and is a simple to use method to refill the customers lighters with a no mess clean up. The cans also have universal fueling tips making it accessible to fill any type lighters.